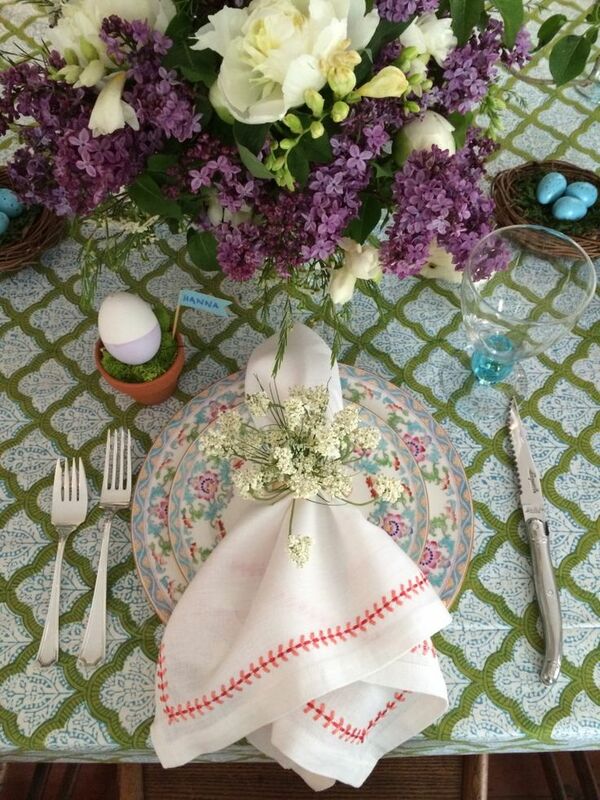 I'm bringing back this delightful Easter table from Olivia over at Lacquered Life. LOVE her fabric tablecloth mixed with her beautiful china. Not to mention the flower arrangement and the tiny touches of turquoise. Just beautiful. I'm hosting Easter this year and have yet to spend two seconds thinking on menu or table. I'll be making a mad dash at all of it on Saturday. But I have been hoarding goodies for the kiddos' Easter baskets and I can't wait to put the finishing touches on them! Hope you have a wonderful weekend...see you next week! beautiful -LOVE The flowers especially! One of my all time favorites. I love Roberta Roller Rabbit and had completely overlooked this pattern and colorway ( you cant tell its aqua from the stock web photo) until I saw this photo last year. It prompted me to buy the round tablecloth for a decorators table and a bunch of throw pillows! Beautifully done, a lovely creation!